Skagway’s Mayor just received a kind thank you note from Ken Serey of Tipp City Ohio. He was reading a history of Dayton, Ohio and it seems that after the great Dayton flood of 1913, the citizens of Skagway sent a check for $92.42. That, along with other individual contributions from all over North America and overseas totaled $129,700. Ohio authorities contributed $430,000 and in all, $2 million was sent to Dayton, but the damage amounted to $300 million. 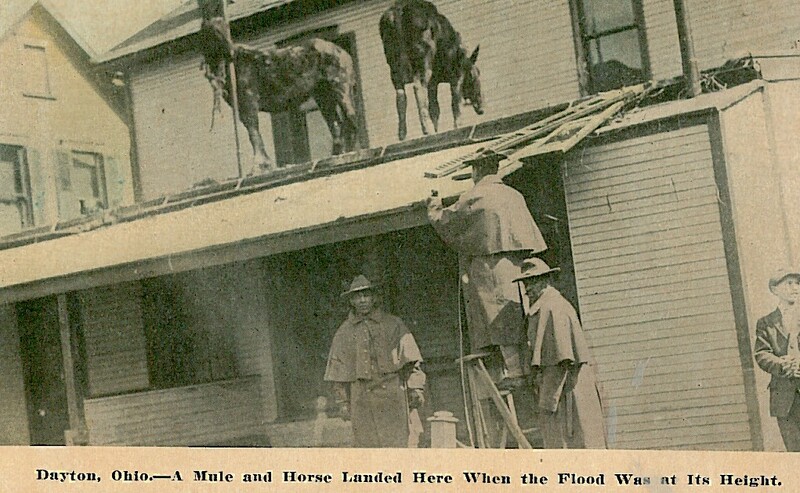 The picture above is a mule and a horse on the roof where they ended up after the flood – hmmm, I wonder how they got down! Hamilton Ross Robinson was born in Anson, Maine in 1872, but left his wife and two daughters behind to work on the railroads up north. In 1898 Heney hired him and put him at the front saying he was a “veteran at the game of railway building”. Robinson had worked across Canada building railroads and had most recently worked on the Stikine River building track to Telegraph Creek. 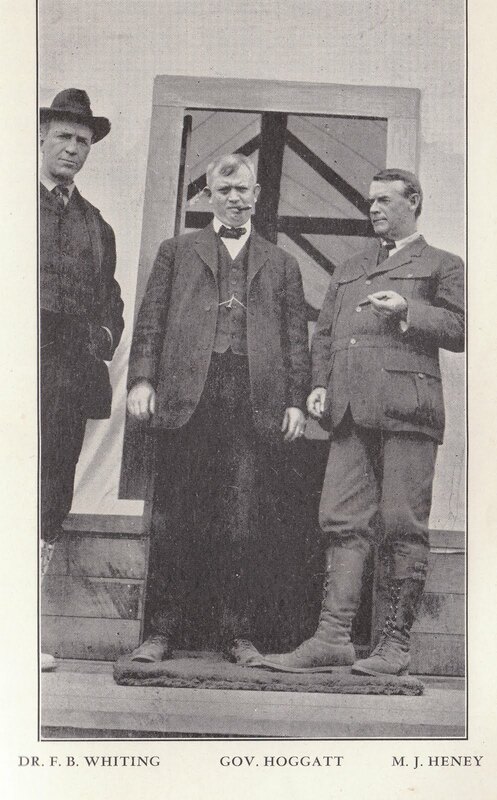 He became the White Pass master of transportation and was ambassador to Canada from White Pass. He was known as the “Master of Horse” as head of the grading gang. He later opened the Robinson Roadhouse which is a roadside pulloff on the road to Whitehorse today. 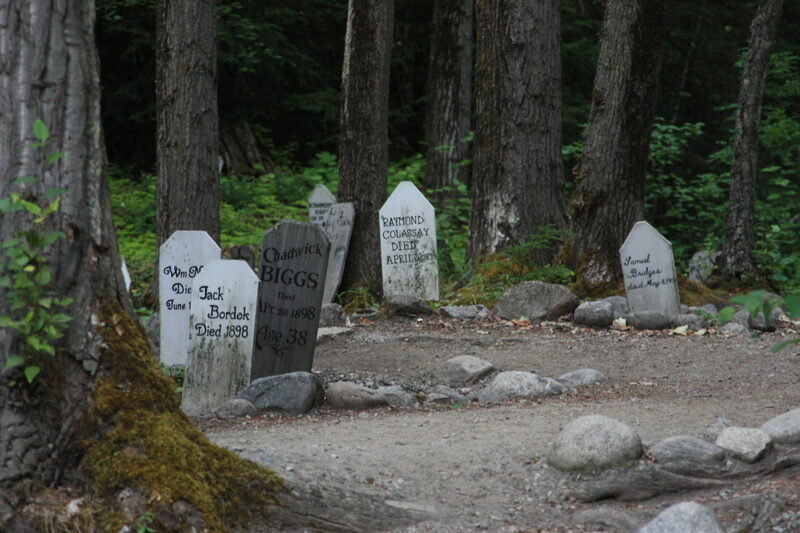 He returned to Maine where he died in 1926 at the age of 54. 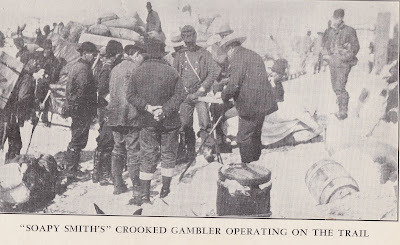 Whiting described him as a mountain of a man with huge calloused hands, which is evident from the photo of him above. Here’s that photo that I posted before, it was mislabeled to be Heney in the middle, but actually that charming mug is the governor, Wilford Bacon Hoggatt! 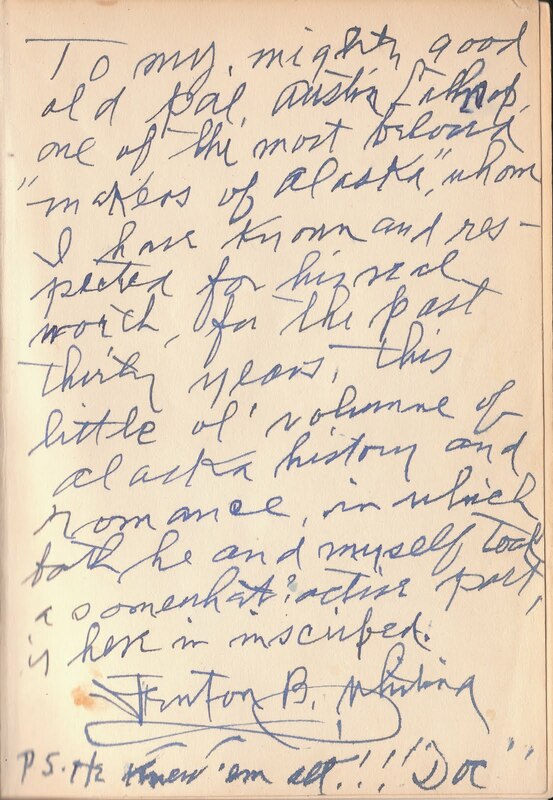 This is a scan from the same book, Grit, Grief and Gold by Whiting. Here is a photo of the AYP in 1909 which opened with 80,000 visitors. Brothers John and Frederick Olmstead, designed the fairgrounds. The central portion of the grounds was oriented along axes that exploited the natural beauty of the setting, with views of Mount Rainer, Lake Union and Lake Washington. Built on 250 acres of the largely undeveloped campus of the University of Washington (and partially funded by the state legislature for later use by the University), the AYPE grounds were close to downtown and convenient transportation. Though most of the buildings, designed by John Galen Howard, were too poorly built to survive, the landscaping of the grounds added value to the university by removing wilderness and opening new possibilities for future university installations. The grounds were centered around the Arctic Circle, with its cascading fountain and reflecting pool, and the surrounding Court of Honor, flanked by two wings of three buildings on either side. Descending from the domed Government Building, these six building were named for Europe, Asia, Alaska, Hawaii and the industries of Manufacturing and Agriculture. Among other notable AYPE buildings was the Forestry Building, a massive structure built entirely of huge logs in their natural state and surviving for several years after the Exposition as the Washington State Museum, until it was damaged by beetles and razed in 1931. This is one of my favorite photos from Chealander and Childer’s AYP Exposition. It is of a few little Eskimo babies lined up like puppies. They do not look very happy about it all! John Chilberg was born on this day, January 19, 1867 in Wappello County Iowa. 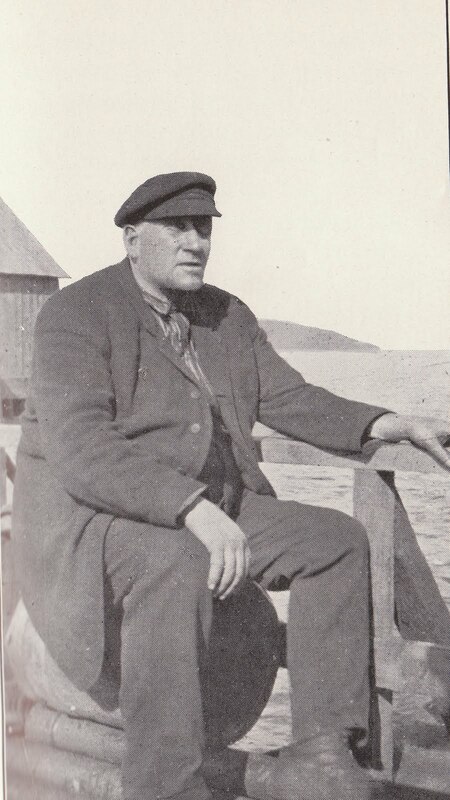 In 1899 Chilberg was responsible for the steamship SOVEREIGN and was also Captain of the MONARCH. 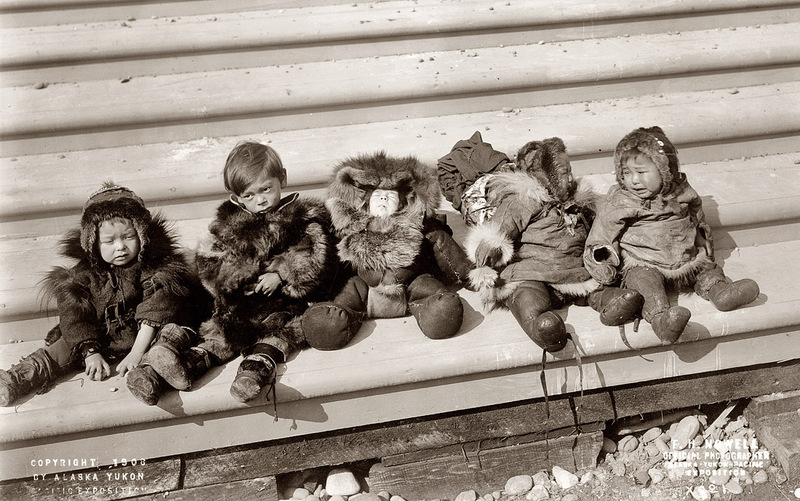 While living in Nome, his friend Godfrey Chealander conceived of the idea to have an exposition of Alaska in 1907 and convinced Chilberg to help him organize it. 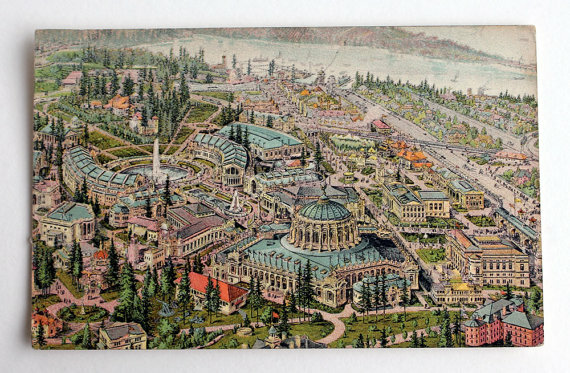 Chilberg became President of the Board of Directors for the Alaska-Yukon-Pacific Exposition held in Seattle in 1909. Held on the University of Washington campus this was Washington’s first world’s fair and it celebrated 12 years of prosperity — since the 1897 Alaska Gold Rush — through the display of resources, products, and advantages of Washington and the region. More than three million people visited the fair from Washington cities and counties and from the rest of the country. 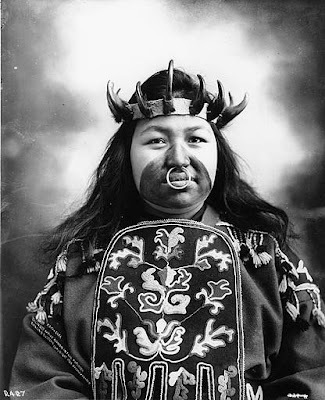 In 1915 Chilberg was President of the Miner’s and Merchants Bank of Ketchikan. By 1919 he also ran a fleet of ships in Puget Sound. 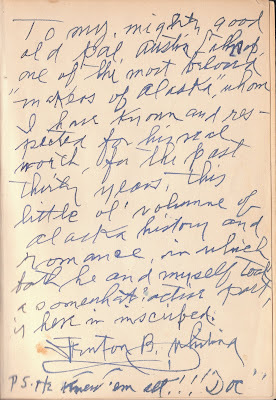 In 1967 he was living in Berkeley California with his son Hugh, a real estate investor. J.E. 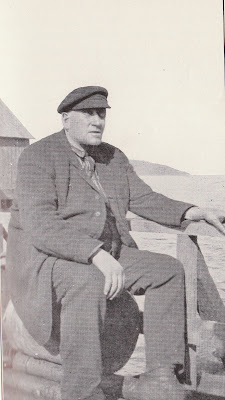 Chilberg died in 1954 in Laguna Beach, California at the age of 87. 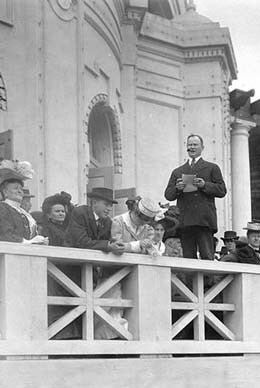 Chilberg is seen above addressing the AYP Exposition in 1909.